There are a large number of different reasons why you may need to fill out form DS-5504, otherwise known as the application form for Name Change and Data Corrections for your United States passport. One of the most common reasons is marriage – if a bride takes her husband’s name (or vice versa), an existing passport will need to be corrected in order to reflect this legal name change. Someone may have also decided to change their name legally for any other reason between the time the passport was issued and now, further requiring the use of a form DS-5504. It is important to note that if you need to correct your passport because of a printing or spelling error, this can be done for free at any time that the passport is still valid. The processing time for this type of correction is typically four to six weeks with expedited services this could be sooner. Form DS-5504 is available for you to access for free at any time from the US Department of State’s website. Note that you will need a copy of Adobe Reader, or any other program capable of opening and displaying the contents of a PDF file, installed on your copy in order to open the form in your browser. There is no way to submit the form online for processing – you can only view it in your browser. To print a blank copy of the form that you can then fill in with a pen, click the “Print” button in your browser window to continue. Fill out the form to the best of your ability and include all required supporting documents. This will include your most recent US passport book and/or passport card, a recent color photograph to be used as an updated passport photo and all evidence that is in support of your name change or the other changes that you want to make to descriptive data. You will also need to submit checks for the required processing fees and other payments when you send your DS-5504 form to either of the previously stated addresses. Note that the full name, along with the date of birth, of the applicant in question, MUST be printed on the front of your check. How long does a name change process take? Thanks. 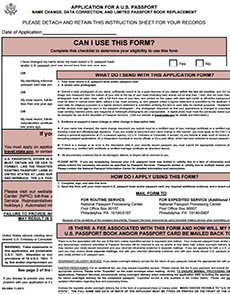 Hello, if the passport is over a year old, it will be a DS 82 renewal app and along with all renewal documents, such as the current passport, passport photos and passport fees ( $110 for passport book), you will need to submit your original/certified copy name change documents you will mail everything in directly to the US Department of State, address listed on your DS 82 app. My passport expired on December 11,2016. I also got divorced so my name changed back to my maiden name. So do I need to fill forms DS-11 and DS-5504 for name change? How much is the charge $170??? I have had a gender and name change change by Court Order. Which form do I use for that? I am not eligible to use DS-5504 because it has been more than a year since I got my passport. Will DS-82 allow me to change my gender? is she a naturlizied citizen? I need to change my name on my passport from maiden name to married name, I went to the post office in my town, the form I was given to mail I is DS-82. From what I am reading on this page, the form I have is not the correct form. Do u need Togo back to get the DS-5504? I have a passport that was issued in 2009 and will expire in 2019. I am submitting a DS-82 along with my court order for a name change. My question is will the expiration date still be 2019 or will it be for 10 years once processed? Thank you. How do I pay the fees? By check? If so, to whom do I make it out? My first name was split in half, and I need it to write together in one word. Can I have it fixed? I got married in 2014 and changed my name then, but my current passport still has my old name on it. on the form DS-5504 it says you must have changed your name less than one year since my most recent passport was issued. that is not true for me, my passport was issued in 8/6/14 and I changed my name on 11/19/14. What form do I fill out to send in with my marriage cert and my old passport? I got married less than a year ago, but my passport is a few years old do I still use the DS-5504 form? What are the fee’s for passport name change? which spelling name is correct?